This summer in July, the Healthy Life Reinforcement shop hosted sixteen students from Streatham and Clapham school in England. 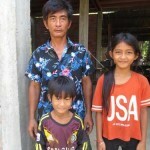 They came to assist the shop team with their collaboration with families living in rural poverty near Battambang, Cambodia. It was a wonderfully experience of assistance for everyone. 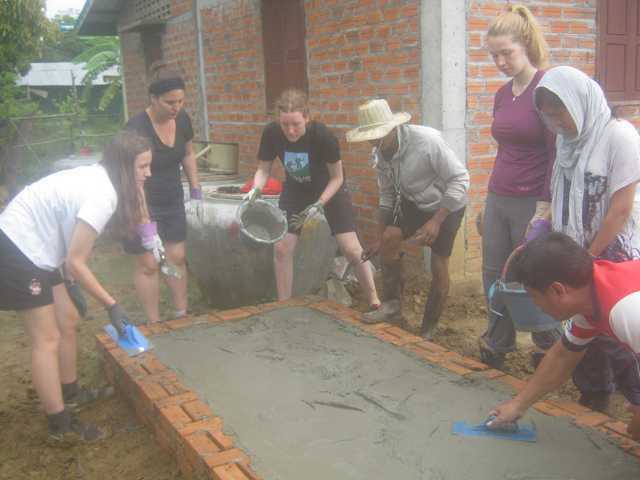 The students experienced life in rural communities while working hand to hand with the shop team and families to build three productive vegetable gardens, two water reservoirs and a toilet for local families, as well as participating in teaching a class in a school. 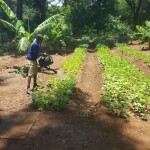 During the five day visit, the student and shop teams built gardens as well as prepared organic inputs for them, including three compost piles and six liters of natural pest repellant and growth booster sprays. Every student was actively involved and worked amazingly hard. They participated in preparing the soil and building vegetable gardens, working with sand and cement to construct concrete bases and install concrete rings for water reservoirs and a toilet. All new jobs and skills! They visited a local Battambang school and played with and taught the children by showing them examples of ways of learning used in England. 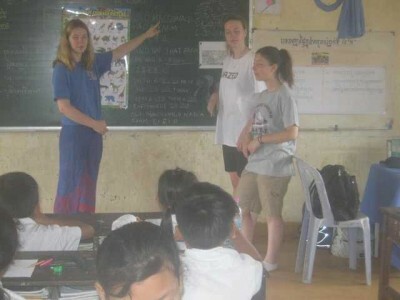 This was a helpful and joyful trip for the students, the shop team, families and community. Shop manager Salee and his team were extremely happy to facilitate the projects for the students, and are very grateful to them and their logistics partner True Adventures for their visit. 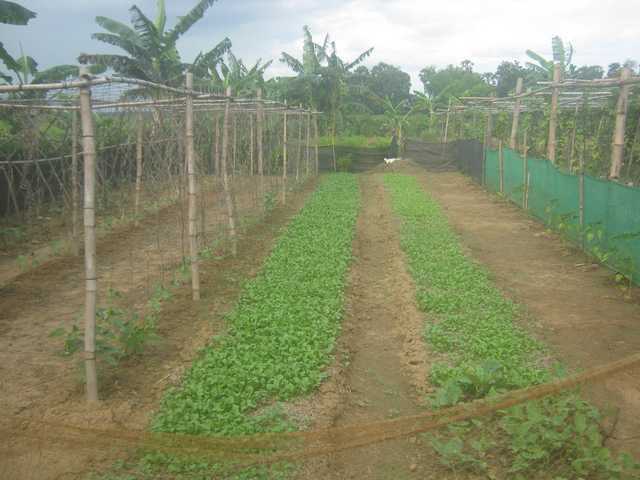 The three new vegetable gardens are now contributing to improving the quality of the families’ lives because every week the families harvest vegetables from their gardens to cook daily food and sell some surplus vegetables for additional income to support their children’s education. 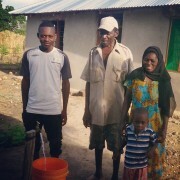 The new water reservoirs enable the families to store rainy season water for use in the dry season when there is a lack of water. 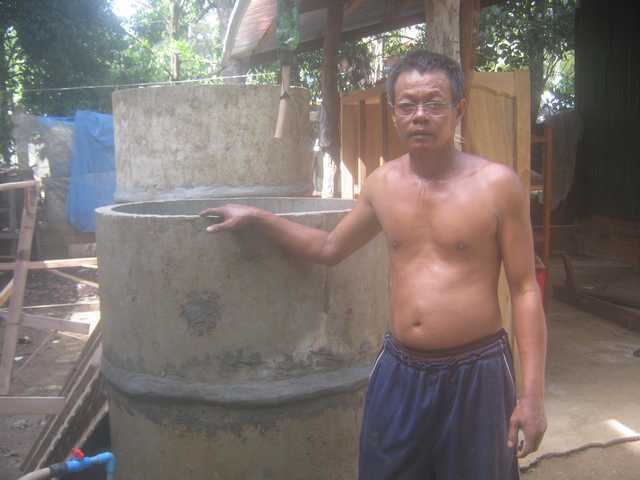 The reservoirs help the families to have enough water to drink and cook. 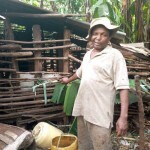 The toilet has given a family a hygienic and safe alternative to using the unhealthy alternative of going to toilet in the bush or rice field near their home. These benefits assist the individual families to become more self-reliant in health, food and income, and also contribute to improving the quality of life in the community as a whole. 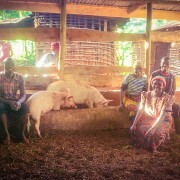 The shop manager, Salee, says the students will always be welcome and he and his team hope to see them again and again!